Guest Bio: Dr. Jacques Miller is a distinguished research scientist and immunologist know for the discovery the function of the thymus and for the identification, in mammalian species of the two major subsets of lymphocytes (T cells and B cells) and their function. For his discoveries in the UK and Australia, Professor Miller has been awarded the highest international academic honours, including the Copley Medal of the Royal Society of London, and the Prime Minister’s Science Prize (2003). He is a Fellow of the Australian Academy of Science (1970), a Fellow of The Royal Society (1970), a Foreign Associate of the US Academy of Sciences (1982) and a Companion of the Order of Australia (2003). 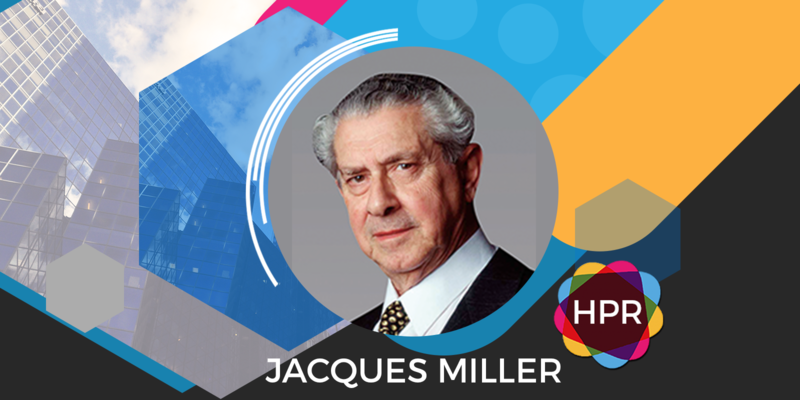 Segment Overview: In today’s interview, Dr. Jacques Miller talks about his world changing discovery of T lymphocytes which are responsible for protecting our bodies from infection which has won him the prestigious Japan Prize. The Japan Prize is highly competitive with over 13,000 nominators strictly comprised of prominent scientists and researchers from across the globe. Tabetha Moreto: Hello everyone, welcome to Health Professional Radio. I’m your host for today, Tabetha Moreto. Our guest today is Dr. Jacques Miller, a distinguished research scientist. He has been honored with the prestigious Japan Prize for his world-changing discovery of T-lymphocytes which are responsible for protecting our bodies from infection. Without further ado ,welcome to the show Dr. Miller. It’s wonderful to have you here. Dr. Jacques Miller: Well thank you very much. T: First of all Doctor, I want to say congratulations on this reward. You must be very proud of your research. M: Thank you very much. Yes, I’m delighted to have received the Japan Prize, it’s a very prestigious prize given by your peers who know about your work and find it significant. T: Very interesting. Can you please tell the audience more about yourself and the nature of your work? M: Yes. I did Medicine at the University of Sydney and then I went to London to do a PhD in cancer research. And during my PhD, I found out that the thymus which is an organ below the sternum and above the heart is highly important. It was thought to be redundant and useless. But I found out that it makes lymphocyte which are now called T-cells which control the body and make sure that infections are fought so that it removes virus infected cells and it also tries to destroy cancer cells. T: Yes, wonderful. So Doctor with this research that you have done, so who does it benefit? M: Well it would benefit many, many people because we know now that T-cells fight off infection. We know that when things go wrong, you get autoimmune disease like rheumatoid arthritis and diabetes. And now, we know how to make sure that T-cells can attack and destroy some types of cancer cells. T: I see. I’m sure that this will benefit many people around the world, millions of people who have cancer. M: Yes. Well at the moment, it’s only about 20% of melanoma and a few cancers like lung cancer … but not all types of cancer. We have to work harder to find out why it’s not all types. T: In speaking of all types of cancers, what is your next step doctor? So what is the next part of your research? What are you going to do now? M: I’m officially retired but I can talk to young people who are we doing research at the institute where I work and we just plan experiments. For example, we want to know how T-cells can be educated to prevent autoimmune disease, that’s a step we’re leaping at. T: I see. And doctor if you don’t mind, I’d like to ask you a personal question. Why are you so passionate about this type of research? Why are you so passionate about science and medicine? M: I think it’s so interesting. I mean I’m very curious as to what happens especially when things go wrong. You have to investigate the reasons why they go wrong because normally they shouldn’t go wrong. So there must be something wrong and that’s very exciting because when you find out why and you can do something about it, well you get such a thrill, it’s very, very, very exciting. T: Yes that’s right, that’s true. When it comes to medicine and science, there’s always new things to discover. T: How about when you were young Doctor? Were you interested in science and medicine? M: I was interested in medicine from a very early age. One of the reasons was that my elder sister contracted tuberculosis and my younger sister and I did not and I always wondered and we lived in the same room in the same house. So I always wondered why is it that she went down is tuberculosis and we did not in spite of the fact that we played together. T: I’m so sorry about what happened to your sister. T: So Doctor tell us, are there any misconceptions regarding your research that drives you crazy and it keeps you up at night? M: Well it depends what happens and if we’re you’re trying to find the solution to a problem and you don’t, well that keeps you up at night because you want to find a solution. But normally I mean the world goes well with what you’re excited about and you can sleep well. T: Yes. I absolutely agree with you Doctor. When you can’t find a solution to something that drives a lot of people crazy. Alright. So doctor so aside from this research regarding cancer, what other research have you done before? M: Well most of my work was on T-cells, T and B cells, the two types of lymphocytes that I discovered in 1967 to 1968 where called “T for thymus derived” and “B-cells” which make antibody and they are coming from the bone marrow, not any other places. So bone marrow derived cells, they are abbreviated as B-cell and thymus derived cells as T-cells and we also found out that T and B cells talk to each other, they communicate. T-cells help B-cells to make antibodies. T: Wow. So these cells really talk to each other. Very interesting, thank you doctor for sharing this. This is something that I just learned today, thanks to you. What is your main takeaway message to all of the listeners of Health Professional Radio? What would you like to say to them? M: Well I think that it’s very important to ask the right questions and to formulate the correct hypothesis and of course, to follow up what you’re curious about. It’s very interesting to be curious about certain things that belong in the body. So I think research is very important because it’s the only way we’ll ever find out what goes wrong and that’s what we have to deal with people who have diseases. Something has gone wrong, we have to stop it. T: Excellent message Doctor. And also before we go, there’s another question I like to ask you, why is this topic relevant to health professionals? M: Because T-cells and B-cells are involved in most diseases and I think immunotherapy which seeks to suppress unwanted response in autoimmune disease like multiple sclerosis and diabetes or enhance responses against cancer is likely to transform the treatment of many human diseases in the next 10 years. T: Excellent. And now Doctor for those who want to get in touch with you, how can they contact you? M: Well I’ll be back in Australia in 4 to 3 days time and my my mobile number is 0417 345 343 so they can contact me to my phone number if they want to. T: Excellent. Thank you so much doctor for coming on the show. I really appreciate it. M: Thank you very much for getting me. T: And that was Dr. Jacques Miller. We just been talking about his amazing research on T lymphocytes. If you liked this interview, transcripts and archives are available at www.hpr.fm. We’re on all social media platforms so don’t forget to follow, like and subscribe. We’re also available for download on SoundCloud and iTunes. I’m Tabetha Moreto and you’re listening to Health Professional Radio.